Hurricane Preparedness Week, May 15-21, is a perfect time to start thinking about how to prepare for a potential land-falling tropical storm or hurricane. On average, 12 tropical storms, six of which become hurricanes form over the Atlantic Ocean, Caribbean Sea or Gulf of Mexico during the hurricane season which runs from June 1 to Nov. 30 each year, according to the National Weather Service. In the Central Pacific Ocean, an average of three tropical storms, two of which become hurricanes form or move over the area. 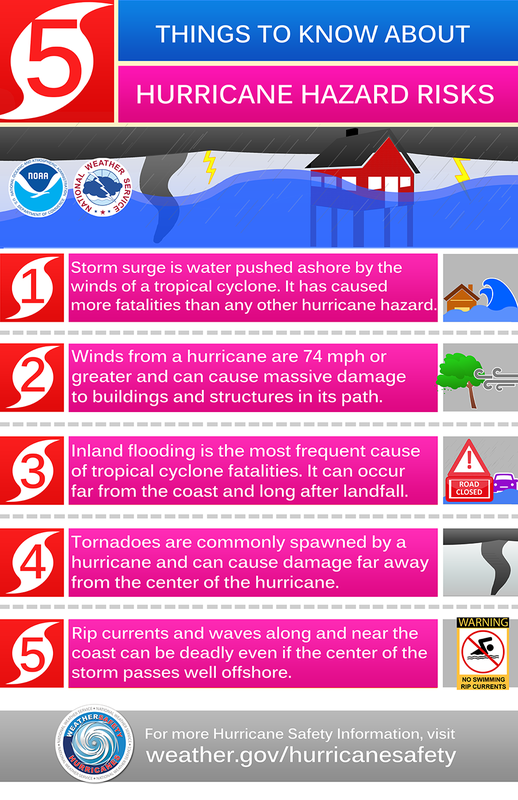 The primary hazards from hurricanes, also known as tropical cyclones, are storm surge flooding, inland flooding from heavy rains, destructive winds, tornadoes, and high surf and rip currents. While hurricanes pose the greatest threat to life and property, tropical storms and depression also can be devastating. Find out today what types of wind and water hazards could happen where you live, and then start preparing now for how to handle them. Hurricanes are not just a coastal problem. Their impacts can be felt hundreds of miles inland. 2. Develop an evacuation plan. Find out if you live in a storm surge hurricane evacuation zone or if you’re in a home that would be unsafe during a hurricane. If you are, figure out where you’d go and how you’d get there if told to evacuate. Identify someone, perhaps a friend or relative who doesn’t live in an evacuation zone or unsafe home, and make a plan with them to use their home as your evacuation destination. Be sure to account for your pets, as most local shelters don't accommodate pets. Put the plan in writing and share with loved ones. 3. Get an insurance check-up. Make sure you have enough Homeowners' insurance to repair or even replace their home. If you're a renter, be sure you have adequate coverage. Don’t forget coverage for your vehicle or boat. Remember, standard Homeowners' insurance doesn’t cover flooding. Whether you’re a homeowner or renter, you’ll need a separate policy for it, and it’s available through your insurance company, agent or the National Flood Insurance Program at www.floodsmart.gov. Act now as flood insurance requires a 30-day waiting period. You’re going to need supplies not just to get through the storm but for the potentially lengthy and unpleasant aftermath. Have enough non-perishable food, water and medicine to last each person in your family a minimum of one week. Electricity and water could be out for at least that long. You’ll need extra cash, a battery-powered radio and flashlights. Many of us have cell phones, and they all run on batteries. You’re going to need a portable, crank or solar powered USB charger. 5. Fortify and prepare your home. Make sure your home is in good repair and up to local hurricane building code specifications. Many of these retrofits don't cost much or take as long to do as you may think. Have the proper plywood, steel or aluminum panels to board up the windows and doors. Remember, the garage door is the most vulnerable part of the home, so it must be able to withstand the winds. 6. Identify trusted sources of hurricane information. NOAA's National Hurricane Center and Central Pacific Hurricane Center are your official sources for hurricane forecasts and the issuance of hurricane watches and warnings. Your local NOAA National Weather Service forecast office provides information regarding the expected impacts from the storm for your area. Emergency managers will make the decisions regarding evacuations. 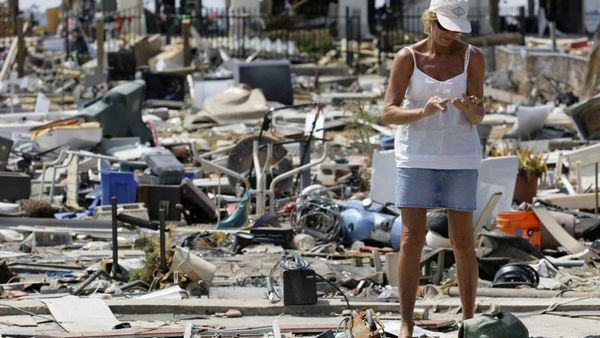 Organizations such as the Federal Alliance for Safe Homes make disaster safety recommendations. And the media outlets will broadcast this information to you. All work together to be your trusted sources, especially for those less able to take care of themselves. 7. Create a written hurricane plan. Take the time now to write down your hurricane plan. Know where you'll ride out the storm and get your supplies. You don’t want to be standing in long lines when a hurricane warning is issued. The supplies you need will probably be sold out by the time you reach the front of the line. Being prepared, before a hurricane threatens, makes you resilient to the hurricane impacts of wind and water. It will mean the difference between your being a hurricane victim and a hurricane survivor.